General Hospital spoilers relate that Kristina Davis (Lexi Aisworth) prepares herself for a big commitment to Dawn of Day, Ava Jerome (Maura West) asks for help, and Jordan Ashford (Briana Nicole Henry) continues to push her limits as she tries to figure out a way to solve the Ryan Chamberlain (Jon Lindstrom) case. If you missed all the General Hospital spoilers, catch up on the highlights with your General Hospital recap. GH Spoilers relate that Jordan refuses to take it easy. She admits to Curtis Ashford (Donnell Turner) that she spent most of her dialysis treatment arguing with Margaux Dawson (Elizabeth Henderickson) about the Ryan issue. Margaux wants to close the case, but Jordan believes he is alive and a threat, as he’ll surely return to Port Charles. Curtis isn’t happy to hear Jordan isn’t taking it easy, and continues to worry. So much so, that when she asks him to carry on the investigation himself, he refuses. Can she change his mind? We’ll see. Also on the subject, tests show that Ryan’s hand was detached while he was still alive. And we never thought we’d be writing that phrase. Only in Soap World. Ava isn’t sitting around waiting. She is positive the discovery of Ryan’s hand means he’s alive, so she gathers Laura Webber (Genie Francis) and Felicia Scorpio (Kristina Wagner) to devise a game plan. They agree that Ryan has an obsession with Ava that will bring him back to town if he’s alive, as well as a pride issue that forced him into a mistake before. Ava believes if she pretends to have gone on with her life and is happy with another guy, Ryan will come back, and they can deal with him. Laura thinks this is a really bad idea. Actually, she calls it suicidal, and points out the obvious: not only would Ryan likely kill her, but he’d kill the man he sees as having stolen what’s his. Ava’s not worried, and she says as much while touching her purse. Laura does not like okay with what that implies. Kristina is happily preparing for her big initiation into The Trust while Sam McCall (Kelly Monaco) is searching the attic. After rehashing her search, Sam nearly gets caught, but manages to hide before Shiloh (Coby Ryan McLaughlin) and Harmony (Inga Cadranel) enter. She overhears them talking about the ceremony and how she gave up something about her family. Once they finally leave and she’s able to escape, she hurries to find Jason Morgan (Steve Burton) to tell him about the initiation that will happen at midnight. She’s not the only one with intel. Michael Corinthos (Chad Duell) has learned from Willow Tait (Katelyn MacMullen) that this initiation is a no-turning-back deal that will pretty much end with her in Shiloh’s bed. She reiterates how dangerous this organization and its leader are, so he thanks her and rushes off to spread the word. Together, he, Sam, and Jason decide that this is too serious a situation. Kristina has to be pulled out now before she’s made the big commitment. Sonny Corinthos (Maurice Bernard), as you might remember, had summoned Dr. Neil Byrne (Joe Flanagan) to his office yesterday. Today, we see that he’s brought the man there to speak about his daughter. Neil’s reluctant to help, as he refuses to be party to a kidnapping, then repeats almost everything he’d said to Alexis Davis (Nancy Lee Grahn) before. 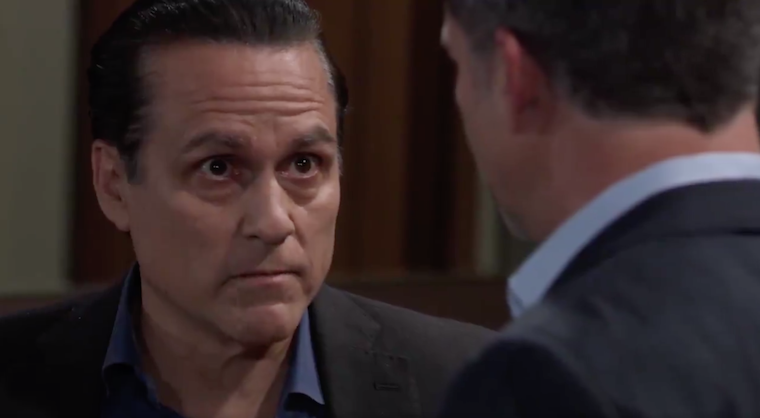 Sonny is nothing if not persistent, and during their conversation, Neil seems to realize that Sonny is the impatient father that Alexis spoke of. Sonny won’t be denied, though, and implores the good doctor to perform exit therapy on Kristina. He says this is his daughter’s life and future at stake, and eventually Neil relents. He did, however, make it clear to Sonny that this therapy doesn’t always work, and his last one ended badly. Meanwhile, Kristina takes a picture with Shiloh to mark the occasion, then takes the next step to full indoctrination by signing on a dotted line before her ceremony. She does question a couple of things, like Shiloh’s participation in the ceremony, and why that paper is needed when she had given him the tape, but he does his typical thing and she drops it. Lord, deliver us from stupid. In our opinion, this girl is going to need way more than Dr. Neil to get her head straight. 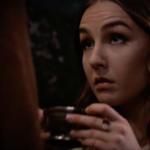 Days of Our Lives Spoilers Wednesday, April 10 Update: Jennifer Repays Jack For Rescuing Her Years Ago, But Is That Enough To Annul Sham Marriage Orchestrated By Eve?